If you're looking for a casual yet on-trend getup, consider teaming a white crew-neck t-shirt with Tommy Bahama boracay flat front pants. Both items are totally comfortable and will look great paired together. 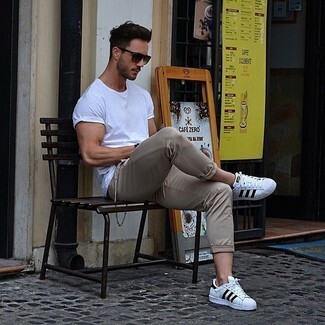 Consider beige plimsolls as the glue that will bring your outfit together. So as you can see, being a dapper dude doesn't require that much effort. 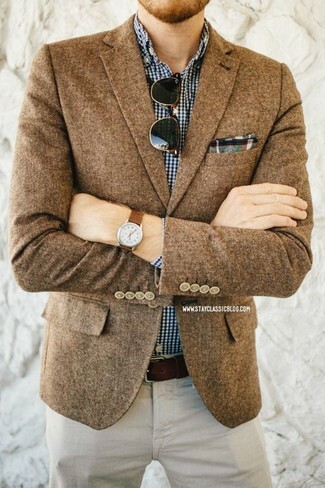 Just pair a brown wool blazer with beige chinos and you'll look savvy. 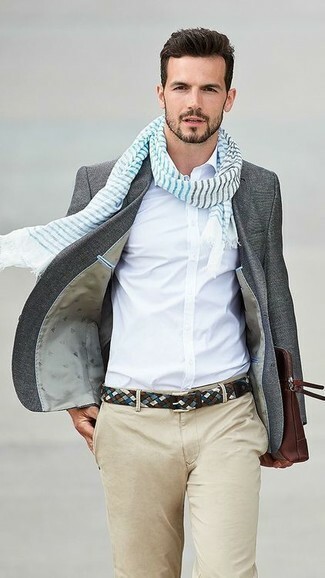 This combination of a beige check blazer and Tommy Bahama boracay flat front pants from Nordstrom is very easy to pull together in no time flat, helping you look awesome and ready for anything without spending a ton of time rummaging through your closet. For something more on the daring side to round off this outfit, grab a pair of beige denim slip-on sneakers. For a smart casual getup, pair a charcoal wool blazer with Tommy Bahama boracay flat front pants from Nordstrom — these pieces the place of work beautifully together. 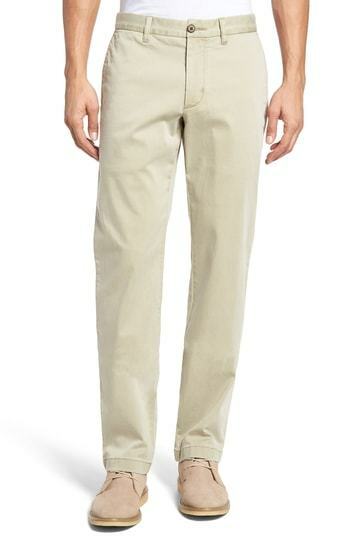 If you're facing a fashion situation where comfort is prized, try pairing a white crew-neck t-shirt with Tommy Bahama boracay flat front pants from Nordstrom. When it comes to shoes, this ensemble pairs nicely with white and black leather low top sneakers. If you're on the lookout for a casual yet stylish getup, choose a green plaid long sleeve shirt and Tommy Bahama boracay flat front pants. Both garments are totally comfortable and will look great together. 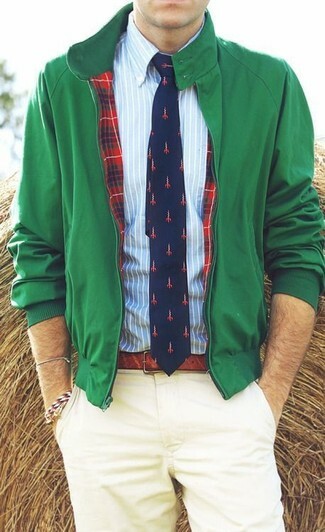 When it comes to footwear, this outfit is round off wonderfully with brown suede boat shoes. This combination of a blue blazer and Tommy Bahama boracay flat front pants is very easy to pull together without a second thought, helping you look dapper and ready for anything without spending too much time combing through your closet. 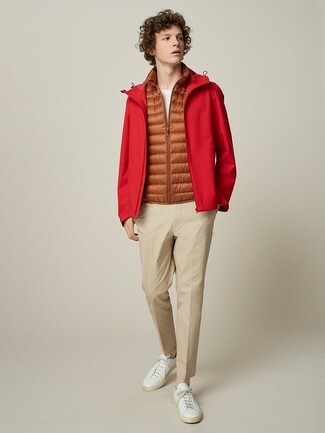 If you're in search of a casual yet dapper getup, dress in a red windbreaker and Tommy Bahama boracay flat front pants. Both pieces are totally comfortable and will look great paired together. When it comes to footwear, this look pairs wonderfully with white leather low top sneakers. If you're on the hunt for a casual yet seriously stylish outfit, pair a green bomber jacket with Tommy Bahama boracay flat front pants. Both items are totally comfortable and will look great paired together.